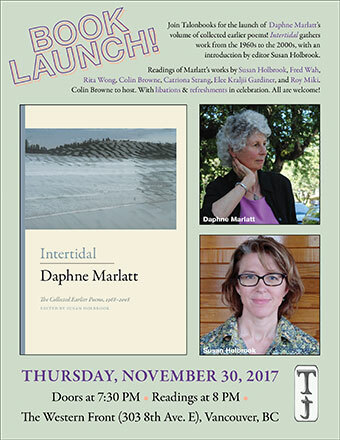 Daphne Marlatt’s new volume of collected earlier poems launches next week in Vancouver, BC! All are welcome at the Western Front on Thursday, November 30 for readings and refreshments (doors at 7:30 PM, readings at 8 PM). If you wish, RSVP on Facebook. Intertidal gathers work by Marlatt from the 1960s to the 2000s and includes an introduction by editor Susan Holbrook. Selections of Marlatt’s works will be read by poets Susan Holbrook, Fred Wah, Rita Wong, Colin Browne, Catriona Strang, Elee Kaljii Gardiner, and Roy Miki. Colin Browne to host.